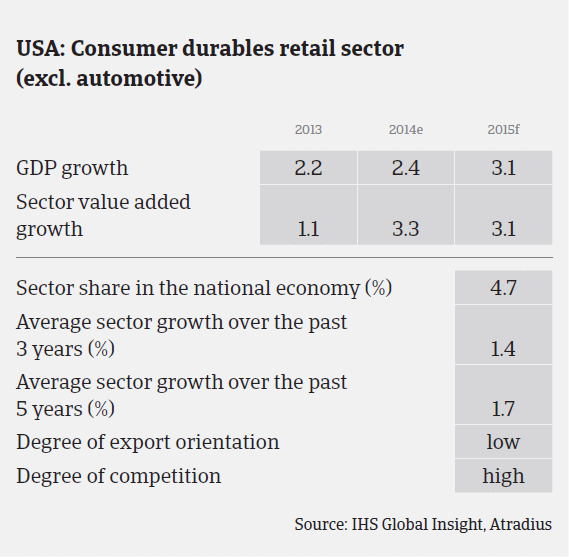 The general outlook for the US consumer durables industry remains positive. 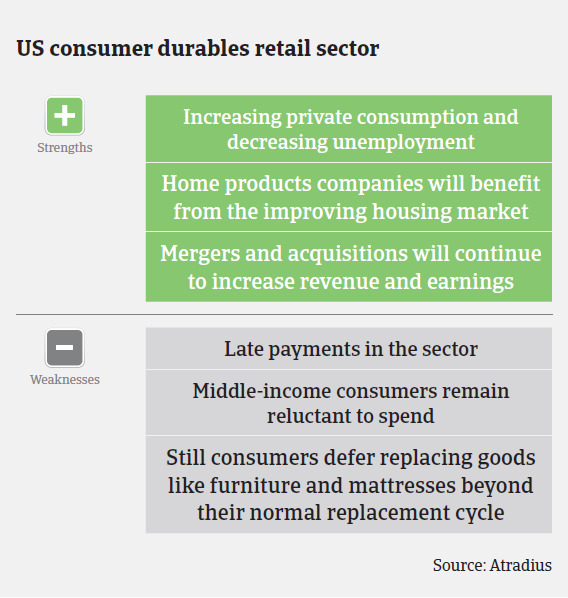 Although the recovery of the US housing market has been slower than expected, it is still sufficiently strong to benefit home products companies, which generate about half of the consumer durables retail sector´s revenue and operating profit. Given the combination of discretionary and non-discretionary demand for consumer products, core macroeconomic indicators correlate with consumer spending as well as indicators that influence consumers’ willingness to spend on ‘bigger ticket’-items. The US economy grew 2.4% in 2014 and is expected to increase 3.1% in 2015, while unemployment is expected to drop to 5.5% in 2015. Together with improving consumer sentiment, those indicators support higher top-line sales growth. That said, it is expected that the Federal Reserve will raise the currently low interest rate of 0.25% this year, possibly as early as June 2015, as the US economic rebound gains momentum. This could dissuade consumers from taking on more debt in order to fuel spending, and therefore impede consumer durable demand growth to a certain extent. Consumer durables retailers´ aggregate operating profit is expected to increase 5.0%-5.5% over the next 12 to 18 months. This is slightly down from a prior forecast of up to 6% growth, due to the uneven housing market recovery as well as to rising food and healthcare costs, which could hamper consumer durables spending by middle-income consumers. While the improvement of the housing market remains uneven, the generally positive trend will nevertheless benefit home products companies, because consumers typically replace appliances, mattresses, carpets and furniture when they buy or build a home. Replacement demand remains a key driver of growth in the current economic environment, especially for major appliances, bedding, and lawn and garden equipment. The replacement cycle for home products bought during the mid-2000s housing boom is beginning to take hold, as many of these products last five to 10 years. If economic growth and housing market rebound continue as forecast, it is expected that consumers will move forward with deferred purchases, releasing pent-up demand. However, despite the principally good outlook for consumer durables retail, there is always the risk that sales prices may suffer if demand unexpectedly slows and competition intensifies. And while high earners continue to spend, thanks to gains in the housing and equity markets, many middle-income consumers still remain cautious, partly due to the rising food and healthcare costs. Mergers and acquisitions and shareholder returns are expected to increase in the US consumer durables sector in the coming 12 to 18 months. Higher-rated companies will continue to increase shareholder returns through dividends and share repurchases as earnings and cash flows improve. Our outlook for the overall consumer durables sector should be viewed as mildly conservative. Specific industry subsectors may be viewed more positively than others. For example, the outlook for household appliances remains positive in 2015. Despite the general upswing, the consumer durables retail sector continues to be characterized by increased competition and continued price and margin pressure. Therefore, businesses within the industry should be carefully evaluated and liquidity should be closely observed. Payments take 90 days on average, and we noticed increasing non-payments in the last couple of months. However, we do not expect them to increase further in the coming months. 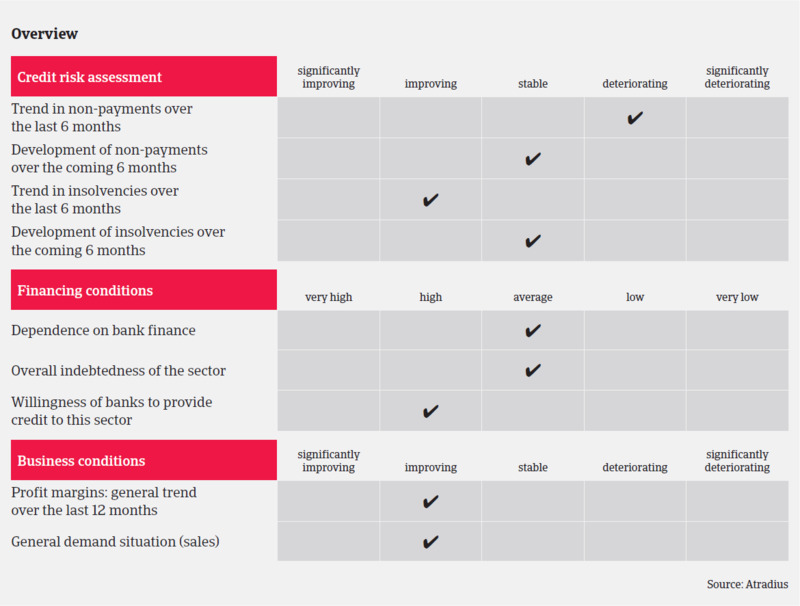 Insolvencies have decreased in 2014 due to better performance, and are expected to level off in the coming months. For smaller credit limits we will take into consideration the years in operation and other available credit information. If this information does not support the coverage, we further look to obtain recent financial statements and detailed trading experience. In considering coverage on a buyer that belongs to a group, we attempt to obtain financial statements specific to the subsidiary. If this is not possible, the strength of the parent is taken into consideration and the group strategy is used as a reference for the final decision. Depending on the size of the request, we often contact the owner of the parent company requesting an updated opinion on the group.